The flower of even the most succulent variety of tomato produces no nectar, rendering it almost invisible to honeybees. A bumblebee, however, can see it; by buzzing upon the flower at just the right frequency, it is rewarded with thousands of tiny pollen grains to stick all over its furry body. Once finished, the bumblebee moves onto the next flower, shedding some pollen grains and picking up some new ones along the way. In doing so, the bumblebee not only collects food to feed its growing colony, it also helps farmers produce large juicy tomatoes – something honeybees can’t do. 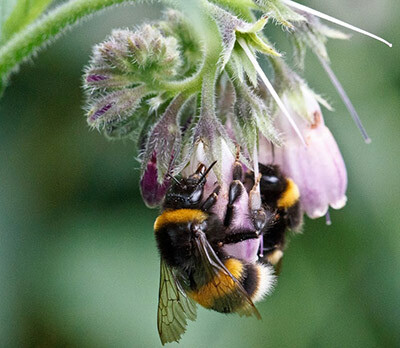 Bees – particularly bumblebees and honeybees – are vital for growing the food we eat. They help pollinate an estimated 30 percent of our food crops, not to mention honeybees producing millions of tons of delicious golden honey. But our enthusiastic use of commercial honeybees for pollination and honey production, and more recently, commercial bumblebees for the pollination of high value fruits, may be putting wild bee populations – which are an important part of the ecosystem – in jeopardy. Over the last few years, we have seen a worrying trend in bee diseases threatening commercial honeybee populations, with Varroa mites, deformed wing virus and the bacterial disease foulbrood killing millions of honeybees around the world. 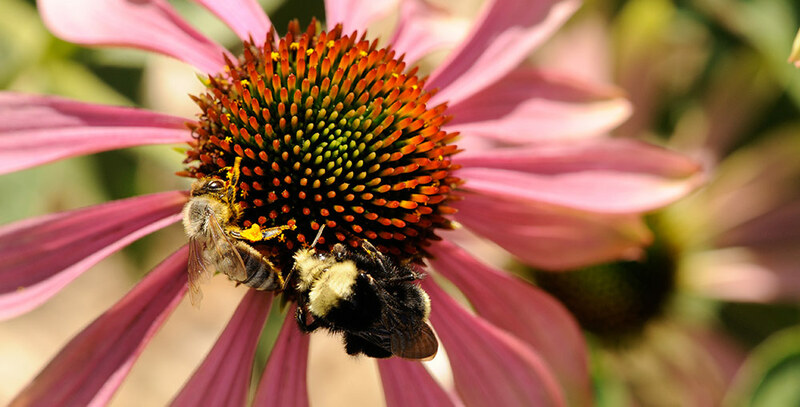 As it turns out, some diseases have also been spreading to wild bee populations. Now researchers from the University of California, Riverside, Natural England and the University of Sussex are calling for stricter screening and regulations to protect them. In a new review published in the International Journal for Parasitology: Parasites and Wildlife, they suggest commercial honeybees and commercial bumblebees should be screened regularly for parasites and other diseases to protect our wild bees. Beekeeping is not new; we have been farming bees for centuries for honey and to help pollinate crops. As agriculture intensified over the last century, however, wild bee populations declined, increasing the demand for honey and vital pollination services. This has led to an increased use of commercial bees in the last 60 years or so. Although this increase has led to more pollination and honey, it has also increased the spread of disease. Bee diseases like deformed wing virus and parasites like the Varroa mite can ravage colonies and spread fast between hives, maiming and killing millions of bees. The spread and incidence of disease has been increasing in recent years, exacerbated by the international bee trade. Every year, hundreds of thousands of honeybee and bumblebee hives are moved across borders around the world, taking parasites and pathogens with them. We’ve been introducing unnaturally high densities of bees into some areas, and we wanted to review what effect that was having on the health of the local wild bee populations. Dr. Graystock and his colleagues looked at instances where managed honeybees or bumblebees have been used in different areas and how they might be affecting wild bees. In particular they looked at where wild honeybees or bumblebees have become locally extinct following the introduction of commercially managed bees into the area. They also considered whether bringing healthy bees to an area could still diminish wild bee health. The researchers suggest three mechanisms that may be harming the health of bees: parasite facilitation, parasite spillover and parasite spillback. 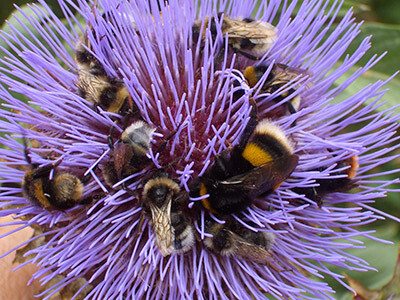 Large numbers of managed bees introduced to an area can cause stress in wild bees due to competition for food, for example. This makes the wild bees more susceptible to infections already present in the population, so diseases spread faster than they would without the managed bees in the area. This parasite facilitation puts wild populations at greater risk of their own diseases. Parasite spillover, on the other hand, involves managed bees transmitting new parasites to wild populations. The parasites can establish themselves in wild populations or be reintroduced repeatedly by managed bees. This puts wild populations at risk of new parasites, particularly if they are in close proximity to managed bees. Transmission can go the other way too – in parasite spillback, wild bees transmit disease to managed bees, where it spreads and intensifies amongst densely managed bees, before being transmitted back to the wild bees. Again, this puts the wild populations at greater risk of infection due to the increased prevalence of the parasites. 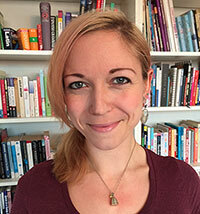 The researchers look at several case studies showing these three effects. Perhaps the best-known example is the movement of the Varroa mite. Last century, the European honeybee, Apis mellifera, was transported to Asia, where it was exposed to the parasite Varroa jacobsoni, which was endemic in Asian honeybee (A. cerana) populations. The parasite spilled over to the European bees, resulting in a new species: V. destructor. Movement and trade of the European honeybee then allowed almost global spread of this parasite, which continues to ravage bee populations worldwide. There are ways to mitigate the impact of managed bee colonies on wild populations and these are different for managed honeybees and managed bumblebees. Honeybees are everywhere in the environment, so it’s difficult to control where they go; a colony of 60,000 honeybees can forage over an area of more than 100 square kilometers. In this case, it’s important for bees to be thoroughly screened for disease before being moved or released into new areas. Unfortunately, legislation only requires honeybees to be checked for a few signs of disease and that is not mandatory in all countries. Managed bumblebees, on the other hand, are brought in to pollinate limited areas, such as strawberry plants growing in a polytunnel. The UK alone imports over 10,000 bumblebee colonies every year from Eastern Europe; although the UK requires a check for symptoms of the biggest honeybee killers, there is little to no requirement for the screening of many bumblebee parasites. Also, regulation for this global trade in bees varies between countries, with some having poor or no effective policies in place. So what can be done? Mitigation efforts should begin at the source, say the researchers. Infection of managed bees often occurs at rearing centers, so making sure these are disease-free is a good first step. Several diseases are transmitted via pollen that the bees eat, so irradiating the pollen to kill pathogens could help. Some breeding practices – such as exposing bumblebee queens to honeybee workers to encourage egg laying – should also be reconsidered. Bees that are transported from different areas are more likely to introduce harmful exotic parasites, so strict legislation controlling the import of non-native bees can limit spread of some harmful parasites. For bee species that can be imported, disease screening is vital and should cover a wider range of parasites. Improving barrier control on polytunnels and glass houses could prevent wild and managed bumblebees from mixing. Finally, boosting wild populations by increasing hedgerows and wildflower field margins would reduce our reliance on managed bees. These mitigation efforts would cost money, but Dr. Graystock says investment is vital to the health of our bee populations, including funding for conservation efforts. For some populations, it’s too late to turn back the clock – parasites have already taken hold. But if we want to protect other populations from disease and make sure we have wild bees in the future, now is the time to invest in their health. We hope this review will help highlight gaps in legislation and make sure the use of managed bees doesn’t impose needlessly high risks on our important wild bees. Peter Graystock et al: “Do managed bees drive parasite spread and emergence in wild bees?” International Journal for Parasitology: Parasites and Wildlife (November 2015). 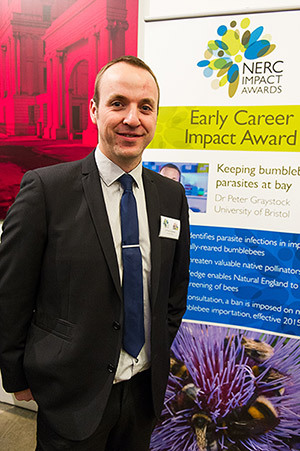 Dr. Peter Graystock (@PeterGraystock) spent five years in the UK researching the effects of bee disease and agricultural practices on wild bees. In 2015, he was recognized with an award by NERC - the Natural Environment Research Council for the impact of his research following changes to bumblebee import policy in England. 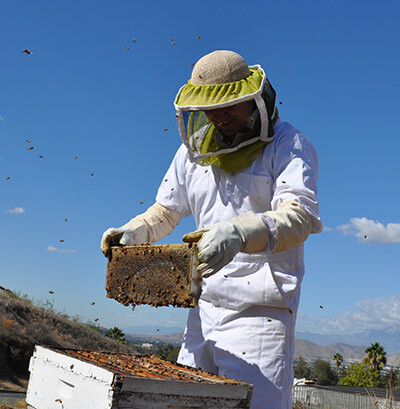 Dr. Graystock is currently a postdoctoral scholar at the University of California, Riverside, researching the significance of interactions between wild bees and microbes. The International Journal for Parasitology: Parasites and Wildlife publishes research on parasites of all wildlife, invertebrate and vertebrate. This includes free-ranging, wild populations, as well as captive wildlife, semi-domesticated species and farmed populations of recently domesticated or wild-captured species. The journal publishes articles on all aspects of wildlife parasitology, including taxonomy, biodiversity and distribution, ecology and epidemiology, population biology and host-parasite relationships. It also covers the impact of parasites on the health and conservation of wildlife as well as “one health” and the nature of interactions between wildlife, people and domestic animals, including disease emergence and zoonoses.